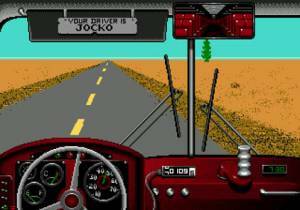 Desert Bus Absolute Entertainment (U.S.A.), EA Games (U.S.A.), 1995 Play it Now ! The player drives a bus and has to reach Las Vegas from Tucson (575 km). The bus runs at real time. Thus the player has to drive during 8 hours. It's impossible to take a break or to let it thrust alone (The bus goes to the right side). So the player has to controls the bus all the time. When the bus arrives at Las Vegas, the player wins one point!